Congratulations to Laura & Suky who get hitched at the beautiful Stoneleigh Abbey in Warwickshire. The first dance was taken alfresco in the Courtyard to the strains of Natasha Bedingfield and a breathtaking fireworks display while the couple were spotlighted by us, through an open doorway, over 50 yards away. Simply stunning. 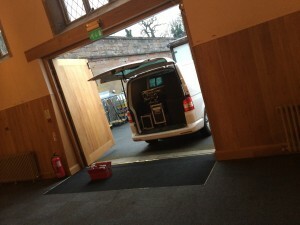 As a professional mobile DJ you need a pretty big rig for this venue as it a massive and very stately room. I’m extremely proud of the lighting we use and the sound amply filled the space (much to the local residents chagrin!) But from a lazy point of view, how easy was access…?! It’s not just about access but making sure your wedding DJ entertainment at Stoneleigh Abbey is absolutely perfect. Check if Dave Clarke is available for your date.